Institutions can now change the text in the From field of e-mail messages sent from FACULTY180. This includes e-mail messages sent through the Communication tab and messages related to evaluations. 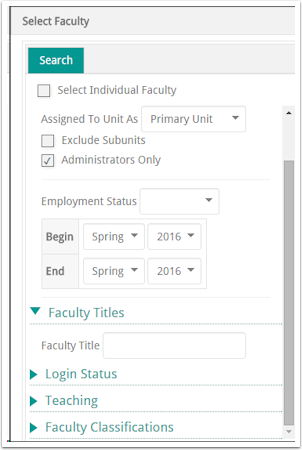 Currently, the text in the From field says FACULTY180 – institutions can specify different text to display in the From field that is more relevant to their institution, such as the institution’s name. In the General Information section, select the desired logo if necessary. In the Miscellaneous section, specify the text for the From field in the Name given in from field field. To display a logo in e-mail messages, please submit a support ticket to have this functionality activated. The faculty picker now allows users to filter results based on faculty title. Start Term is now Start Date – this indicates the date that the evaluation is scheduled to start or started. End Term is now End Date – this indicates the date that the evaluation is due. The Due Date column indicates the End Date of the evaluation. When specifying the dates and funding periods for a grant, users now have the option of specifying if the funding date for a grant should be based upon the grant’s Start Date and periods. This is helpful if the start date of the grant is different from the date that the grant funding starts. On the Faculty menu, click Activities. In the Grants section, click Add to add a new grant, or edit an existing grant. In the Dates & Funding Periods section, specify the Award Date, Start Date, End Date, and Number of Periods. A pop-up window displays, asking if the funding dates should be recalculated based upon the start date and grant periods.